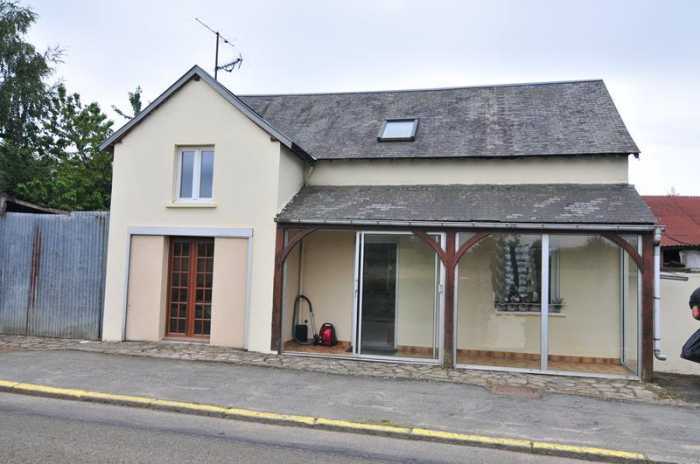 Properties for sale in Normandy, France - AHIB-SIF-00917 Nr Gorron 53190 Attractive village house with garden and outbuildings near the Normandy/Mayenne border. AHIB-SIF-00917 Nr Gorron 53190 Attractive village house with garden and outbuildings near the Normandy/Mayenne border. The house is built of rendered block with a slate roof. It benefits from pvc double glazed windows with some shutters. There is electric heating. It benefits from a fully enclosed garden and large workshop and garage. The house is situated in a position on the outskirts of a village and within walking distance of the bakery, 2 bars, hairdresser, café and small supermarket. The property is found in Mayenne in the Pays de La Loire region of France. The closest airport is at Rennes (78 km); slightly further afield are Dinard Airport (90 km), Angers Airport (109 km), or Deauville Airport (124 km). THE UNESCO heritage site of Mont Saint Michel and the beaches on the west coast are 51 km away. The small local village is just about 500 metres away and has two bars, one of which is the local Tabac, a boulangerie and a small mini-market and hairdressers. The large town of Gorron is 8 kms away and has two supermarkets, patisserie, boulangeries, a choice of restaurants, small cinema and a weekly market. The major town of Mayenne is 17 km away to the south. The market town of Saint Hilaire du Harcouët is 20 minutes drive. The ports of St.Malo and Caen are within 2 hours' drive and the port of Le Havre is about 2 ½ hours away. Cherbourg and Dieppe are also within 4 hours drive. Conservatory 5.96 x 1.26m Sliding patio doors to front elevation. Tiled floor. Lounge 4.58 x 2.66m Convector heater. Window to front and rear elevations. Wood flooring. Dining Room 3.00 x 2.83m Open plan from kitchen. Glazed double doors to front and glazed double doors to east elevations. Wood flooring. Convector heater. Shower Room 2.46 x 1.73m Tiled floor. Partly tiled walls. 2 windows to rear elevation. WC. Corner shower with jets. Convector heater. Vanity unit. Bedroom 1 6.17 x 2.88m Window to front and Velux window to rear elevations. Convector heater. Wood flooring. (Could be divided into 2 bedrooms or an en-suite). Bathroom 2.74 x 1.21m Velux window to rear elevation. Sloping ceiling. WC. Vanity unit. Heated electric towel rail. Cupboard housing hot water cylinder. Bath with tiled surround. Plumbing for washing machine. Study/occasional bedroom 1.94 x 1.93m Velux window to rear elevation. Wood flooring. Convector heater. Telephone socket. Enclosed rear garden. Gravel seating area. Corrugated iron lean-to wood store (former garage). Fenced garden laid to lawn with mature trees and shrubs including cherry tree. Attached Workshop 12.00 x 4.00m (old bike repair shop) Constructed of stone and block under corrugated iron roof. Sliding wooden doors. Power. Concrete floor. Window to front elevation. Attached Single Garage 5.13 x 2.76m Metal doors to the front and side elevations. Electric meter. Mains drainage, water and electricity are connected. Electric heating. Broadband internet connection believed to be available.